This starter kit is great for those who want to experience a hookah pipe and all the delights that come with it. The Mini Shisha pipe has all the tools your need to get started and is beautifully made making it a joy to use. This compact pipe easily disassembles for cleaning and is strong and durable making it a great economical pipe. The colour coded chamber and hose make it a stylish pipe to have around the house and at just £15.99 it’s a bit of a bargain too. Why not order some hookah pipe molasses at the same time to finish off your purchase; available in a huge range of flavours from apple to blackberry there is bound to be a flavour to suit everyone. Great to use on your own, but better to share, the Mini Shisha pipe is the perfect addition to your smoking arsenal. Mini Shisha Pipe – great for travellers and newcomers! The Mini Shisha Pipe is a great product for those new to the hookah scene and that want to see what all the fuss is about. It is also a great travel companion as its compact size means that it can fit into a bag or coat pocket. This shish pipe comes with everything needed to get started; all you need to add is your favourite hookah molasses. It is easy to set up and can be easily disassemble for cleaning to keep it in tip top condition. Check out Shiva Head Shops extensive range of Hookah Pipe Tobacco Free Fruit Mixtures, available in almost any flavour you could ever imagine. The Mini Shisha Pipe is available now for £15.99 and is a great introduction to the world of hookah smoking. 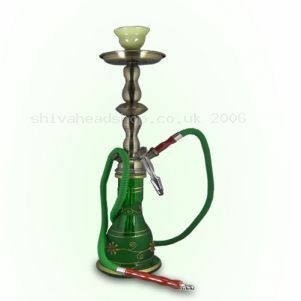 Please note: design and colour of the Mini Shisha Pipe may vary from the picture. High-Life Herbal Molasses – which flavour will you choose? Need some herbal smoking mixture for your shisha pipe or hookah pipe? Then look no further than High-Life Herbal Molasses. Each pack contains 100 grams of smoking mixture available in nine fruity flavours. Choose from flavours including apple, cherry, mixed fruit and peppermint to create the perfect smoke every time. 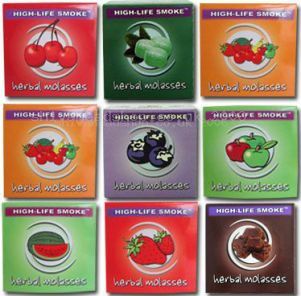 High-Life Herbal Molasses are tobacco and nicotine free making them healthier than standard tobacco mixtures. High-Life Herbal Molasses are available now for just £6.50 per pack or buy two for just £12.99. Not got a pipe? 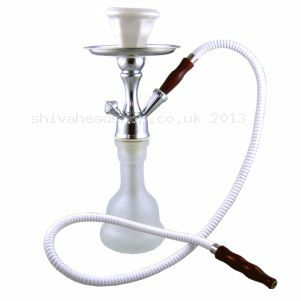 Then check out Shiva’s range of shisha pipes and hookah pipes. Smoking a Shisha or Hookah pipe is a social experience, so why not treat yourself to a sweet smoke that all of your friends will enjoy too. High-Life Herbal Molasses is nicotine and tobacco free and is healthier than standard smoking mixtures, but the best thing about High-Life Herbal Molasses is the range of flavours available. Available in 9 mouth-watering flavours including apple, strawberry, blueberry and choco-fudge, High-Life Herbal Molasses is specially designed for Shisha and Hookah pipes and provides a smooth, sweet smoke every time. High-Life Herbal Molasses comes in 100 gram packs and cost just £6.50 each or 2 for £12.99. So what are you waiting for, order your flavoured molasses today! The Meteorite Hookah Pipe from High-Life is a double hosed pipe that is perfect for just about any occasion. This standard sized hookah pipe makes a great focal point for any room and comes complete with everything you need to get started straight out of the box. The Meteorite High-Life Hookah Pipe features a hand blow glass bowl, chrome plated stainless steel stems, a traditional clay bowl and colour matching Pyrex bowl, cleaning kit and full instructions. Hookah pipes are great for social gatherings and can easily be shared among friends and guests. Here at Shiva we have a range of different flavoured molasses which are both nicotine and tobacco free. Meteorite High-Life Hookah Pipe is available now for just £49.99 and will make a great addition to any room. Please note: The ‘High-Life’ watermark is part of the image and does not feature on the actual product. Colours may vary from picture. The Tropical Shisha Pipe is a great pipe for those starting out or wanting to experience shisha smoking for the first time. This pipe stands 35cms tall and makes a perfect focal point for any room. 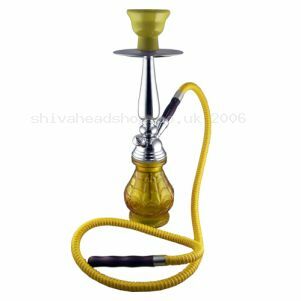 Shisha pipes are used all over the world and are great for social gathering and parties; it is designed to be used with herbal molasses which is available in a range of mouth-watering flavours. This pipe can be taken apart easily for cleaning to keep it in tip top condition and comes with an ergonomic mouthpiece to make it easier to hold. The Tropical Shisha Pipe is available now for just £19.99 and a range of different herbal molasses flavours are available here. Please note that the design may vary slightly from the picture. The Mini Shisha Pipe is the perfect accessory to have if you want to experience the delights of hookah smoking for the first time and is one of the best value starter kits available here at Shiva Head Shop. 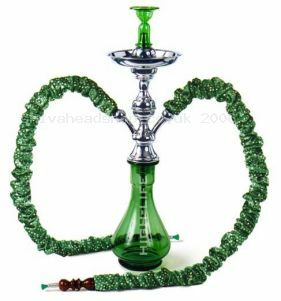 Hookah pipe have been used to smoke molasses for hundreds of years and even features in the popular story of Alice in Wonderland. This beautifully designed Shisha pipe comes complete with all of the tools needed to start smoking, all you have to do is choose which flavour molasses to try, or maybe order a few different flavours. The designs and colours may vary slightly, but you’ll always get a smooth and tasty smoke. Available now for £15.99, the Mini Shisha Pipe is a great introduction to hookah pipe smoking. Check out our range of flavoured molasses to go with your pipe here. The Harem Shisha Pipe stands a colossal 20 inches high and makes a great display piece, as well as providing a smooth smoke. This shisha pipe has a traditional glass base which is decorated with gold flowers and a clear glass stem from top to bottom. The smoking pipe measures 40 inches, long enough for the pipe to stand on a table and the smokers to sit comfortably away from it and the traditional clay bowl can hold a generous amount of hookah smoking blends. Using a shisha pipe is easy; load the bowl with your chosen smoking mix and cover with foil or a specially made shisha coal screen, place the coal on top and light. Leave to heat up for a minute or two and inhale through the shisha hose.